Taüll is a village in Catalonia. Taüll (Catalan pronunciation: [təˈuʎ], locally: [taˈuʎ]) is a town in the province of Lleida, in Catalonia, Spain.With more than 200 glacial lakes and exuberant wildlife, it is considered to be one of the most beautiful natural spaces in Spain and is open to trekkers and all appreciators of nature.The Vall de Boí (or Boi Valley) is a municipality formed by eight small nuclei, known the world over for its’ rich natural and cultural patrimony – apart from the National Park, the valley is also home to a group of nine Romanic churches that were together declared World Heritage Site by UNESCO in the year 2000, and there is also the Boí-Taüll ski resort with 40 kilometres of slopes. The Aigüestortes and Saint Mauricio Lake National Park is one of a total of fourteen National Parks in Spain, and the only one in Catalonia. Situated in the heart of the Pyrenees, it is an excellent representation of the typical ecosystems that can be found in high altitudes.Peaks that surpass 3,000 metres in height; rivers, ravines, waterfalls and swamps that lead us to believe we have been transported to a world of water; more than 200 mountain lakes of many different shapes and colours; a huge diversity of plant and animal life that fights to survive in truly harsh conditions, give life to this protected natural space, unique to the South of Europe.There is a relatively new ski centre at Taull or Boi-Taull. This is separate from the old village of Taull, which is reached from Boi at the end of the Boi Valley. Taüll is about ten minutes from the Aigüestortes i Estany de Sant Maurici National Park. Which is good for hiking and sight seeing. There are also many adventure sports available in the area such as canyoning, paragliding, and kayaking. The best way to get in and out of Taüll is by car. If you are coming to the area to ski a car is a must, because there is no shuttle from the town to the resort. There is public transportation into the town and surrounding areas but it is very limited. If you decide to visit the area and do not have a vehicle ALSA runs a bus from Pont de Suert to Taüll about twice a day. The cost is less than two euros and is about a thirty minute ride. It is also common to hitchhike it the area. As previously stated it is best to have a car. There are taxis that wait by the car park in Boi. They are best if you are going into the National park because there is a set rate. However, they will take you where ever you need to go but it can be very expensive. There is trail you can hike from Taüll to Boi. It takes about ten to fifteen minutes to walk it. Romanesque Church of Sant Climent de Taüll. Romanesque church of Santa Maria de Taüll. Throughout the four seasons of the year, the National Park offers a complete program of activities such as planned guided itineraries, excursions with snow shoes, and nature workshops, presentations, chats and competitions that have the shared goal of informing visitors about the natural resources of the National Park, in order to assure the protection and conservation of these delicate and privileged spaces. The Romanic churches There exists in the valley eight churches and a hermitage that were together declared a World Heritage Site by UNESCO in the year 2000. 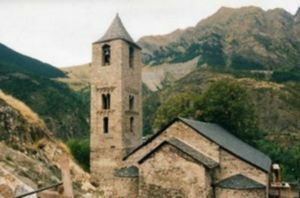 Constructed at the height of the Romanic Period in Spain, the churches of the Vall de Boí are functional buildings made from small blocks of local granite, all with one or three naves, covered with wooden beams or simple barrel vaults. Alpine Skiing The Boí-Taüll Ski Resort was designed with safety in mind. The well defined slopes, at 2,751 metres above sea level, are the highest-located ski slopes in the Pyrenees Mountains, drawn in a single direction down one side of the mountain. Apart from ski and snowboarding, there are a wide range of activities on offer, making the Boí-Taüll Resort the best choice for your winter holiday. Sport Year-round, the magnificent geography of the Vall de Boí allows the practice of sports. In winter: skiing, ice-climbing, snow shoes and snowmobiles; the rest of the year: rock-climbing (with a choice of routes and varying levels of difficulty), descents, excursions and trekking. An unforgettable way to discover the Vall de Boí – combining nature, culture and history – is to walk the near 40 kilometres of marked trails that link all of the towns in the valley. Dry rock walls and paving, all laid by hand, give us a different view of what life in the valley must have been years ago, while at the same time allowing us to enjoy spectacular views and appreciate the flora and fauna of the area. There is only one small store in town which is very expensive. It is recommended that you do most of your shopping in Pont de Suert. This page was last edited on 10 November 2014, at 16:25.